Flex Flag Football is a growing alternative to full contact football and teaches basic skills and concepts of the game. NSYFCA Flex Flag Football provides boys and girls in grades K - 3, a fun and exciting opportunity to engage in light contact (blocking is allowed), continuous action while learning lessons in teamwork. This will be our 2nd season offering Flex Flag. Last year we had an amazing season and with the continued growth we will be able to offer two grade levels of Flag Football for the 2019 season. We will be opening registration for a K/1 team and a 2/3 team. Flex Flag, or "Flex Football" is a variation of flag football that provides young players a "bridge" from traditional flag football to tackle football. 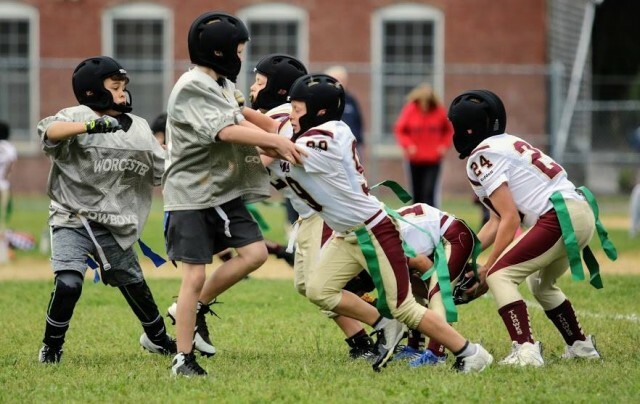 Our program is designed to educate young people about the techniques and skills of youth football while emphasizing participation and sportsmanship. Unlike the town recreation league, the NSYFCA Flag league is a TRAVEL league. Our teams will be competing not only at Algonquin High School, but also in various towns across Central Mass. At this time AYF, has no intention of allowing leagues to carry Flex past the 3rd grade level. Our league, CMYFCC, and AYF are tackle organizations and flag/flex was just something additional we offered at an introduction level. The intention of our Flag/Flex program is for parents to slowly be introduced to the idea of tackle football. There is a lot of bad press around the sport and it was thought that if parents were around a league that had it then they would become more educated about our program.